Midwinter pioneered modern design in mass market ceramics from the 1950s to the 1970s. Under the leadership of Roy Midwinter, the firm brought the style of West Coast America to the UK. Roy Midwinter was not formally schooled in design, but had an eye for where the market was going and which new shapes the public would take to. He steered the firm's output from the organic shapes of the 1950s, through cylindrical modernism of the early 1960s and the flower power motifs of the late 60s, to the mother earth naturalism of the early 1970s. Midwinter was founded by Roy's father, William Robertson (W R) Midwinter, in 1910. The firm's original output comprised teapots and less than glamorous sanitary ware. 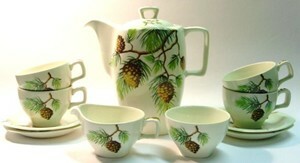 Business went well and by the the 1930s Midwinter was making tableware, including some Art Deco style tea services. However, other firms were showing the lead in terms of design. Roy Midwinter served an apprenticeship with W R Midwinter learning all aspects of the business. On a sales trip to Canada in 1952 he was disappointed at buyers' reactions to the company's products. He discovered that a new style was selling well in North America and was keen to find out more. On a trip to the West Coast of the USA he looked at work by Eva Zeisel and Russell Wright which epitomised the new organic flowing shapes of mid century modern good taste. He adapted their ideas for the UK market. Whilst the US taste favoured rimless or coupe plates and bowls, UK buyers still wanted a rim on their tableware. So the first new range, Stylecraft (1953), still had rims, but brought in more fluid forms and a distinctive 1950s' TV screen shape for plates and saucers. Midwinter launched Stylecraft at a very exciting time for British design. Rationing and Utility were coming to an end, and the public had a taste for new design fuelled by the very successful Festival of Britain Exhibition in 1951. In other fields 1953 was also a turning point. G-Plan furniture launched in that year and new bright and colourful textiles and wallpapers became available. Contemporary ceramics needed to fit in with contemporary taste in the home. Stylecraft was perfect. Midwinter took a lead in the market for contemporary ceramics leaving other manufacturers to copy and play catch up. Midwinter needed to stay ahead and produced a huge number of new designs. Roy Midwinter encouraged design talent both from within and outside the firm to keep his products one step ahead of competitors. In-house designer Jessie Tait put her name to over thirty new patterns in the 1950s. Midwinter's external designers included Terence Conran, who produced a design showing his famous three-legged plant pot holder and several other contemporary patterns, ornithologist and artist Peter Scott, and Hugh Casson, whose Riviera/Cannes design became one of Midwinter's longest runs . As well as having a keen eye for modern design, Roy Midwinter also had an eye for how to market products. G-Plan had done away with traditional suites, selling one piece at at time. Midwinter introduced starter sets, which freed customers from having to buy a whole dinner or tea service in one purchase. They could add to the set they had originally bought with some confidence that the design would not disappear from the shops after a few months. In 1955 Roy Midwinter upgraded his Stylecraft shape with a new design called Fashion. Whilst Stylecraft was a little cautious, Fashion was full blown 1950s' organic shape. Fashion remained in production for many years, carrying many designs from cutting edge contemporary to more conservative floral patterns. Always alert to new developments, Roy Midwinter pioneered an innovative plastic range of tableware called Midwinter Modern. 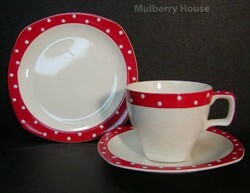 In the 1950s there was a fear in the potteries that traditional ceramic ware might be replaced by Melamine. By the end of the 50s, Roy Midwinter thought the organic forms of Fashion and Stylecraft were looking a bit like last year's fashion and in the 1960s introduced a new range based on the cylinder. The Fashion shape continued though, but appealed to more conservative buyers wanting to be modern, but not too cutting edge. Fashion was a development of Stylecraft. The plates, saucers, cups and dishes are similar. Look out for a rim on the plates, saucers and dishes on Stylecraft. Fashion is rimless; the technical term is coupe. Compare the Stylecraft plate with a rim (right), with the coupe Fashion plate (far right). Stylecraft tea and coffee pots have a more traditional look and are much less flowing and organic than Fashion. 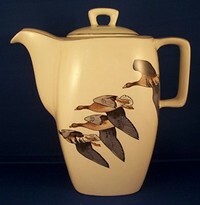 Compare the Cannes coffee pot, (far left) in the Fashion shape with the Wild Geese coffee pot (left), in the Stylecraft shape. Midwinter produced a huge range of patterns in the 50s and 60s on the basic Stylecraft and Fashion shapes. Some were by well-known designers and many by in-house designer, Jessie Tait. These are some of the most popular today. 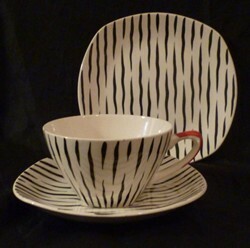 The black and white striped Zambesi pattern with red detail was a contemporary trend in the 1950s. 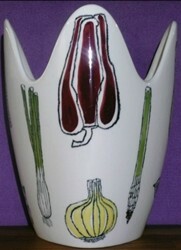 Stripes are also seen on Albert Hallam's strange shaped vases and dishes for Beswick (1954) and much copied elsewhere. It was among the first Midwinter patterns to become collectable. Zambesi achieves good prices on eBay and there seems to be a good market for it. Roy Midwinter worked with Terence Conran to produce Saladware. It was a range of dishes, bowls, plates, cups, saucers, teapots and salad dishes decorated with informal style drawings of vegetables. The most exciting piece is the celery vase (right). This range show's Conran's early thinking. It might very well have been on the shelves of Habitat a few years later. It appealed to people happy to venture further afield for holidays and bring back a more relaxed lifestyle. The vegetables illustrated: red pepper, marrow, gherkin, cress, tomato, sweet corn, radish, garlic clove, mushroom, spring onion, artichoke and carrot would not look out of place in a modern kitchen. This must have been advanced taste in 1950s Britain. Domino is a delightful polka dot pattern on the Stylecraft shape. One of the earliest Stylecraft patterns, it was very much in vogue in the early 1950s. Domino is usually red and white, but blue and green versions also exist. A black version is very rare. These are my favourite Midwinter designs. They bring back memories of holidays in France. 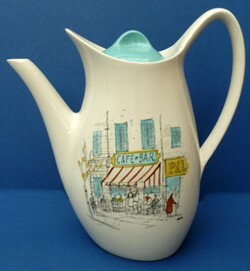 It shows French café bars and harbour scenes. Riviera was drawn by the architect and artist, Hugh Casson. Hugh Casson was a significant architect who had a passion for drawing. He was director of architecture at the Festival of Britain, but also enjoyed working on sketches and water colours. It was his sketches of the Coronation route that drew his attention to Roy Midwinter. His drawings for Riviera were and adapted to the Stylecraft shape by Jessie Tait. Riviera became Cannes in 1960 when the design was applied to the fashion shape. Cannes/Riviera was one of the longest running Midwinter designs with a production run that lasted to the 1970s. Wild Geese features a picture of three geese in flight. It captures the mood of Autumn evenings. Wild Geese was drawn by Peter Scott, better known for founding the Severn Wildfowl Trust at Slimbridge in 1946 (now the Wildfowl and Wetlands Trust). It was made for the Stylecraft shape. Wild Geese is a relative bargain, perhaps because of the naturalistic subject. "I have 2 cups and saucers stamped as Midwinter, but I cannot find anything with the same pattern on any of the many websites I have looked at. Is there anyone who could identify it for me if I send a photo? "I would guess they would be worth from Â£10 to Â£20 each for the serving dishes, but they are not that common. Cracked or chipped items would be worth a lot less. Check out eBay completed listing. I would suggest selling on eBay if you want the best price. I have a coffee set of Midwinter Stylecraft with stamp 'Stylecraft Midwinter Staffordshire Made in England Reg. D 711843 868695' On each item is also red paint? scratch/dot. The problem is that it looks exactly like the Midwinter - Silver Wheat - Red design in shape and colour, but mine has only the red and silver rims and no wheat or other design on it. (the items are -except for the silver and the red rims- plain white.) Someone suggested it could be a set from before Jessie Tait started on the design in 1953. I have no clue and I have nowhere seen the set I have. Is there anyone here that could tell me more about this set? I don't know if I could post a link here, but if you google on Jessie Tait Silver Wheat, it will show exact my set.. just without the Wheat..
"I have a set of Midwinter Stylecraft, Cannes, Hugh Casson comprising 6 cups, 4 saucers, 6 plates and 1 large plate, all in excellent condition. Any advice on price and where to sell them please? "Csn you tell me anything about my set of Stylecraft fashionshape please? the msrkings are - Midwinter Stylecraft staffordshire england - fashion shape 10 - 62. the design is of a desert scene with a cactus. The set was given to me by my mother and I cannot fid this set anywhere on the internet. i'd appreciate any information please. I wondered if you had any idea of value? "I have a 3 tier cake stand? comprised of Midwinter Bird Chintz plates. 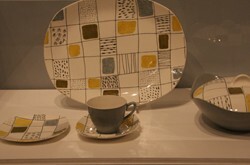 The bottom and top plates are marked as Midwinter Modern Fashion Shape, and the centre one is marked Stylecraft Fashion Tableware by Midwinter. They are all rimless. Do you know if this would have been made by Midwinter, or adapted later on to be a tiered stand? I would think that they have been made into a cake stand later. Especially, if the plates don't match. Midwinter Stylecraft refers to the Stylecraft range. Sometimes you will also see 'Fashion Shape' which means it is Fashion rather than Stylecraft. Cake stands are rare, although there is a trend to turn Midwinter plates into cake stands. Are all the plates the same? If yes it is probably genuine. If not it is probably a cake stand made recently from old plates. The date is June 1960 and refers to when the plate was made. Another thing to check for is are there stamps on the all the plates and are all the dates the same? I am not a collector but have the following from my late mothers estate and wondered if you could advise on value or anyone who may be interested. "Hi, I'm looking for any pieces of the Roy Midwinter Safari Collection. Anybody know where I can start looking? Thank you! I'm looking for Midwinter Nature Study sandwich plates to complete a set if anyone's selling them! "Hi - I have a Primavera television dinner plate in excellent condition for sale. I am under the impression that this is a rare piece, but haven't been able to find much information on it, only a blurb from 2008 . Is there a site that someone can refer me to so that I can do more research on it? "Hi, I have a small very plain cream coloured jug marked W.R.M Burslem England..
a Gravy Boat,"Dogwood Flower" For Sale. I can only find one other like it, for sale near Seattle for $65 U.S.D. "Hello, I am beginning to clear out years and years of hoarding, to my wife's delight, I have a teapot, in the zambisi style by Jessie Tait, it's in mint condition, I have examined it all over and there are no chips or scratching on it at all not on the pot or the lid, I want to sell it but I'm unsure of where or how to try and sell it, I didn't know if there is a particular place I could try where collectors of these may be looking for one to complete the set. A comprehensive collection of items offered for sale. Email for pictures and list of items. "Hi I have a 6 place setting service called Stylecraft Midwinter in turquoise with white fern pattern and silver rims, including 3 sizes of plates, oval serving plates , coffee pot and cups plus also some similar items that have roses instead of ferns and are stamped �fashion�. All are in excellent condition with dates from 1959-1961. "Hello: I came across a small pin dish , 3 and a half inches in diameter, in good condition ( no chips, cracks or crazing, but a little surface fading. We have also acquired a coffee set in Stylecraft which we cannot identify. Any ideas as to the pattern.
" I have a midwinter brama semi porcelain bowl? Its green with gold leaves and grapes, I can find other pieces with the same pattern but not like he bowl I have. "We have a set of 6 small bowls and 1 large bowl with Handpainted ware WRM BURSLEM ENGLAND backstmp The decoration is a green border with leaves and fruit of yellow and blue, loosely painted. "I have a pattern here in Australia 2-60. I cannot see pictures of it anywhere. Style craft fashion shape with a pink flower.